Russian President Vladimir Putin was received as a hero in Crimea today (9 May). He visited the peninsula for the first time since Russia annexed it from Ukraine in March, in a gesture of defiance that has angered the Ukrainian leadership and was branded as “inappropriate” by NATO and Western leaders. Putin arrived in Sebastopol in the early afternoon, in order to participate in Victory Day celebrations. 9 May is celebrated by all post-Soviet countries as the Day of Victory, marking the end of World War II, which cost the USSR 20 million dead. The capitulation of Nazi Germany took place on 8 May 1945, but it was announced in the USSR on 9 May. This year is also the 70th anniversary of the battle in which the Red Army won back control of the Black Sea peninsula from the Germans. This time, however, 9 May had the appearance of a patriotic extravaganza, exalting the might of the former Soviet Union, its wartime leader Stalin, as well as Russia’s present leader, Vladimir Putin. The Russian President first led the military parade in Moscow, which, according to specialists, was the largest in the last 20 years. The Kremlin website lists the categories of military equipment displayed, which includes C-400 anti-aircraft missiles, Topol-M ballistic missiles, T-90 tanks, and overflights of planes including the Tu-22M3, Tu-95 and Tu-160 strategic bombers. In his speech, Putin emphasized that it was Russia’s defence of the Eastern front which determined the outcome of World War II. “We must remain worthy of our forebears’ deeds. They fought to the death with the enemy, defending their native land, and they vanquished Nazism,” said Putin. Since the beginning of the Ukrainian crisis, Russian propaganda has dubbed as “Nazi” and “fascist” the pro-European government in Kyiv and its supporters. Fringe groups that helped topple the regime of former Ukrainian President Viktor Yanukovich, including the Right Sector, can indeed be seen as sympathetic to neo-Nazi ideology. Russian propaganda however assimilates the politics of these fringe groups with the wider pro-EU sentiment in Ukraine, and calls the entire current government fascist, in order to discredit it. A pro-Russia rally in the Ukrainian city of Donetsk, held at the same time as the Moscow parade, saw various speakers exalting the former USSR and comparing the current pro-Russia surge in Eastern Ukraine with the fight against fascism in World War II. Some speakers said today’s fascists were the USA, which, was alleged to have led the ‘putsch’ against Yanukovich and installed the current “junta”. 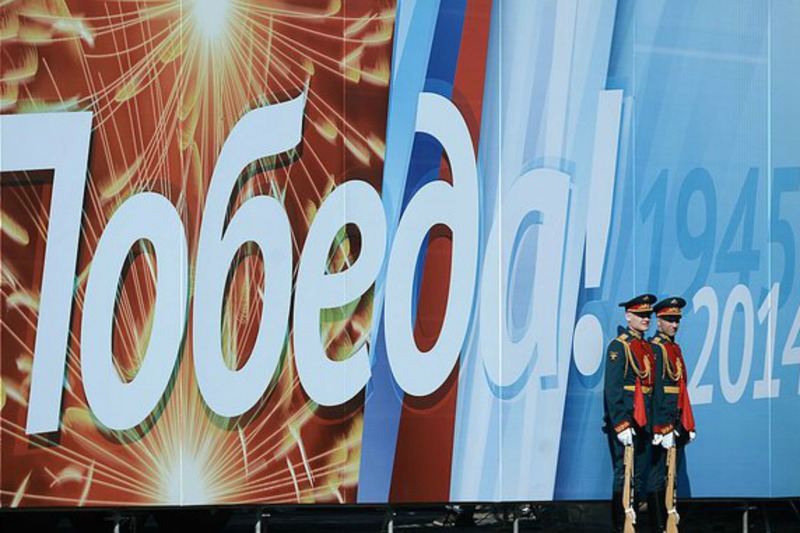 In Sebastopol, Putin hailed an enthusiastic crowd both for the 70th anniversary of the liberation of the port city from the Nazis, as well for the “historic” decision of the “peoples living here” to be “together with Russia”. “A lot of work is outstanding, but together we will withstand all difficulties, because we are together, which means that we have become even stronger,” Putin said. Ukraine’s leadership condemned the visit as a deliberate escalation of a crisis between the two countries. “Such a provocation is yet another confirmation that Russia is deliberately pursuing further escalation of tensions in Ukrainian-Russian relations,” the ministry said in a statement. German Chancellor Angela Merkel said earlier this week that although 9 May was an important date for Russia, the conflict in Ukraine made a parade in Crimea inappropriate. NATO’s Secretary General Anders Fogh Rasmussen echoed Merkel’s words. “I think his visit to Crimea is inappropriate”, Rasmussen told reporters on a visit to Estonia’s capital Tallinn. Ukrainian Prime Minister Arseny Yatsenyuk said in a statement that on Victory Day, he wished to cordially congratulate the veterans, children of war, anyone who, like him saw 9 May as a great day. But he urged “all patriots in Ukraine” to refrain from “any actions that enemies of Ukraine may use in the information war” against the country. The Ukrainian leadership is informed about the black plans of Russian saboteurs and its mercenaries, Yatsenyuk said. “We are taking all measures for safety, but we are opposed by people who are ready for anything. Please, if possible, refrain from any mass actions, and in case of participation in them, to not succumb to provocations,” the Prime Minister appealed. EU foreign ministers are likely to decide on new sanctions against Russia on 12 June. Those are likely to broaden the number of officials and oligarchs under travel ban, and whose assets will be frozen. It is not, however, expected that the Union would decide on the “third level of sanctions” which is tantamount to an economic war on Russia, which would also hit the 28 member countries. Pro-Russian militants control buildings in more than 10 towns in eastern Ukraine after launching their uprising on 6 April. 6 June: V-Day anniversary in Normandy, Russian President expected to attend. President of Russia: ???????????? ??? ?????? ? 70-????? ???????????? ??????????? Leviy bereg, Ukraine: ????? ??????? ? ???? ??????????? ???? ????? ?